Determine the layout of how you want your tiles on the surface you are going to install them on. Dry fit your tiles on the wall in the desired pattern using a pencil or dry erase marker to mark location and where to cut tiles to fit. You'll want to use a wet saw for your diagonal and straight cuts and the tile nippers for any curved cuts. 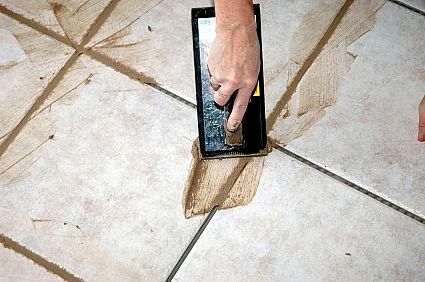 Its always a good idea to have extra tile incase you chip, break, or make an error when cutting your tile. Before applying your adhesive to the wall make sure that the surface is clean and flat. When putting adhesive on your surface make sure only to cover an area that you can set within 15 minutes. Using the trowel scoop out some adhesive and with the straight edge apply it evenly to your surface. Once the adhesive is applied to one section of your surface, switch over to the notched side and comb the adhesive keeping your trowel at 45 degrees to make sure the top of the adhesive has a consistent height. 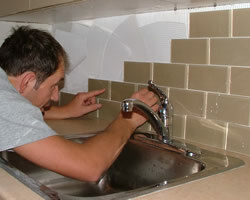 Set your tiles one at a time using a small twisting motion, make sure never to slide a tile into place. Firmly press the tile into the adhesive making sure that it spreads to the majority of the back of the tile. After you place a tile be sure to insert your spacers to ensure uniformity. After your tiles have had time to set which should be determined by the consulting your adhesive packaging, you are ready to grout. Remove your tile spacers and mix your grout according to its instructions. Using your float apply the grout at a 45 degree angle making sure that you press it down into the spaces between your tiles. A damp sponge can be used to clean off any grout that was spread onto the top of the tiles. After the grout has dried hard you can buff any of the haze that was left on the tile surface with a soft cloth until completely clean.